Your audio system supports audio CDs, CD-Rs and CD-RWs in either MP3, WMA or AAC format. With the CD loaded, press the CD button. Do not use CDs with adhesive labels. The label can cause the CD to jam in the unit. WMA files protected by digital rights management (DRM) cannot be played. The audio system displays Unplayable File, then skips to the next file. Text data appears on the display under the following circumstances: • When you select a new folder, file, or track. • When you change the audio mode to CD. • When you insert a CD. 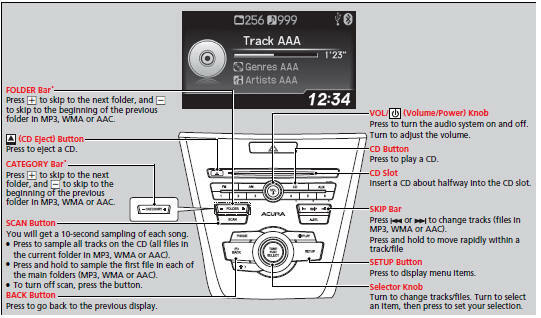 If you eject the CD but do not remove it from the slot, the system reloads the CD automatically after several seconds. 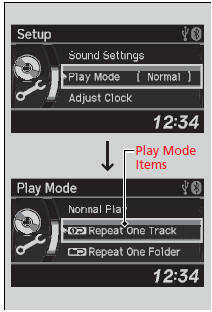 You can select repeat and random modes when playing a track or file. Press the BACK button to go back to the previous display, and press the SETUP button to cancel this setting mode. Repeat One Track: Repeats the current track/file(s). Random in Folder (MP3/WMA/AAC): Plays all files in the current folder in random order. Random All: Plays all tracks/files in random order.